TORRANCE, CA, Oct 08, 2015 (Marketwired via COMTEX) -- Verengo® Solar, Southern California's leading residential rooftop solar installer, today announced a partnership with CaliforniaFIRST that will increase by 40% the number of Southern California residents eligible for financing for home solar systems. CaliforniaFIRST is a public/ private PACE (Property Assessed Clean Energy) financing program administered by Renew Financial that offers homeowners affordable financing for renewable energy programs that they then repay on their property taxes. The partnership will extend financing for home solar systems to homeowners based on home equity, rather than credit scores, noted Verengo CEO Anders Dahl. "The Verengo Solar/CaliforniaFIRST PACE financing options allow Southern California homeowners without stellar credit scores to immediately start saving on their electricity bills by installing rooftop solar without making up front payments," Dahl said. "Our customers will own their solar system and be able to look forward to not only an increased home value, but also a day when their system is fully paid off and generating 'free' power!" The new partnership allows homeowners to take control of their energy cost by going solar through low, fixed payments, even if they have bad credit. "The fact that more than 300 cities and counties across California, including Los Angeles and San Diego, have voted to join CaliforniaFIRST is a testimony to the popularity and simplicity of the PACE energy efficiency financing solutions," said Renew Financial CEO Cisco DeVries. 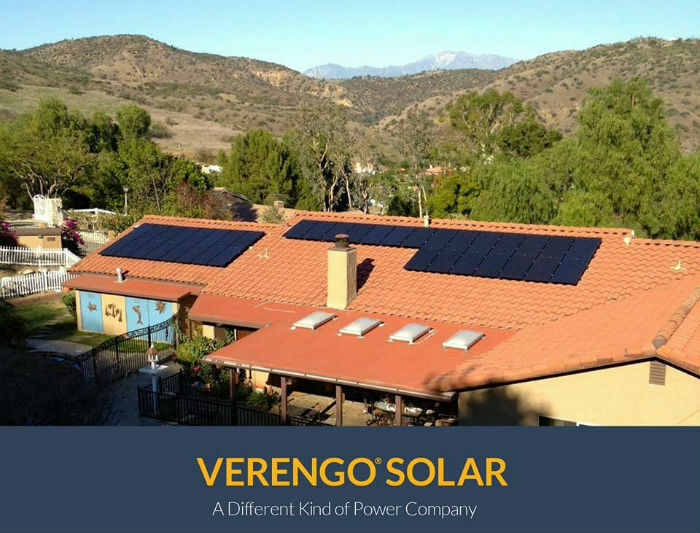 "Verengo has been an industry leader in California rooftop solar since its founding in 2008 and we are delighted to be associated with Anders and his team." To qualify, a home's total mortgage liens cannot exceed 90% of the property value (i.e. the homeowner must have 10%+ home equity). In addition, the homeowner must have paid property taxes on time for the past year, with no more than one late payment in the last three years. Homeowners are also required to have paid their mortgage on time for past 12 months, and have had no bankruptcies in the last two years. "The convenience of PACE loans gives our customers the ability to lock in lower utility rates and increase the value of their home with no out of pocket costs," added Verengo Director of Marketing Chris Haynie. Verengo began installing Solar Panel Systems in 2008. Today, it is the largest Southern California-based solar provider, with over 15,000 Photo-voltaic systems sold, designed, and installed. Verengo offers smarter, cleaner energy alternatives to power your home or business, and consistently maintains an A+ Rating with the Better Business Bureau. Renew Financial was founded in 2008 by Cisco DeVries, who originated the idea of the Property Assessed Clean Energy (PACE) financing model. Endorsed by President Obama and named by Scientific American as one of the top 20 ideas that can change the world, PACE enables property owners to finance the entire cost of energy and water efficiency and renewable energy upgrades to their homes and businesses, and then repay those costs on their property tax bill. Renew Financial has a partnership with SolarCity targeted at small and medium-sized businesses (SMBs) utilizing PACE, and PACE is also a central component of a major White House clean energy initiative unveiled in August 2015. Renew Financial's other financing products include the Warehouse for Energy Efficiency Loans (WHEEL), which opens the residential energy efficiency finance market to large institutional investors.